I’ve been fortunate enough to taste a number of his wines in recent years, and have found myself regularly impressed by both the accuracy of expression of their terroirs of origin and their almost dangerous drinkability. 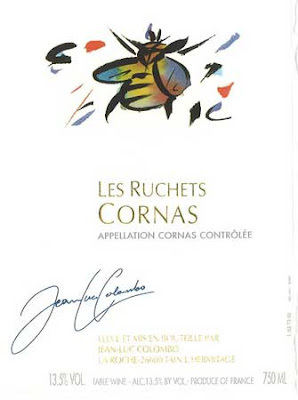 A close friend of mine, Ryan Davis, the Beverage Director of Daniel Stern Restaurants in Philadelphia, was the first person to really turn me on to Colombo’s full range of wines, in particular a 1999 Cotes du Rhone Blanc “Les Figuieres” whose nutty, waxy, still amazingly lively character was stunning after all those years in bottle. And with good reason. I’ve had generally good luck with the Northern Rhone 2002’s, and this one was a standout. It led off with a mature nose of truffles, leather, perfume-y violets and a hint of smoked meats. The acid on the palate was a touch high, but that really just served to keep it all fresh and make it that much more useful at the table. The fruit leaned in the red and black raspberry direction, with lingering notes of cinnamon, white pepper, green olives, and black licorice on the finish. In other words, perfect right now, and a great expression of this tiny, ancient piece of the Rhone Valley: Tied to the land, expressive, a hint rustic, and altogether as honest as wine gets. Delicious.